During the first week of August I was granted the privilege of having a very good spinning friend come to visit, and she brought her drum carder. Behold the fruits of our labor. And, not only did she bring the drum carder, but she brought some more Aussie fur, some llama, and some cotton for me! I was in fiber heaven with a marvelous friend to play with. (Thanks, Legossi!) Here are the cotton batts (the white) and some batts of from the Iowa fleece. They’re nice and fluffy! The cotton batts were rather fun. Legossi brought lots of cotton from the inside of pill bottles. Some of it carded up really well, and some of it did a really weird sort of disintegrating lump thing. All in all I wound up with five or six of them. I’m eager to see how they spin up. We did attempt a test to see if running the fibers in tip first, cut end first, or sideways made any difference. (In other words, after hearing that there were so many opinions I was dying of curiosity.) We found that, with this particular drumcarder, cut end first worked best. There didn’t seem to be much difference between tip or cut end first on the carding level. I don’t know how it would look on the spinning level. And we tried sideways and got a big mess. Whew. It’s been a while since I’ve posted about any personal projects. And as a result, quite a few posts have racked up, so hold onto your hats! I finished spinning these lovely skeins. They’re from the Iowa fleece (the same fleece I’m working on washing) and have a great feel to them. I spun them on the Walking Wheel. The only problem is that I didn’t pay very close attention to the size of the singles as I spun. A little “weight shift” occurred between the skeins. 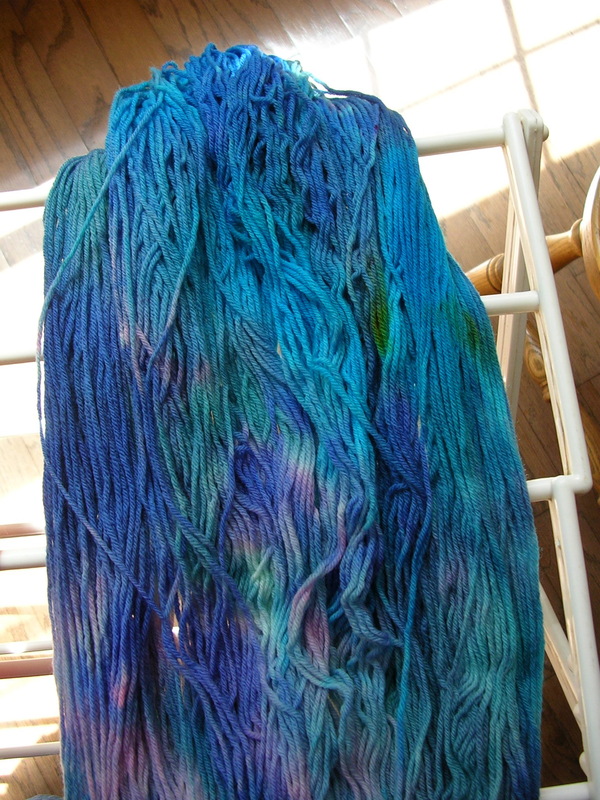 Keen-eyed yarn lovers may notice I have one skein that is thin for the most part, and two that are mainly thick. (I say mostly and mainly because they were “fun” yarns. The kind I don’t grapple with tooth and nail to get the lumps and inconsistencies out.) I’m itching to get these into a dye pot of some kind, but I don’t know what for. 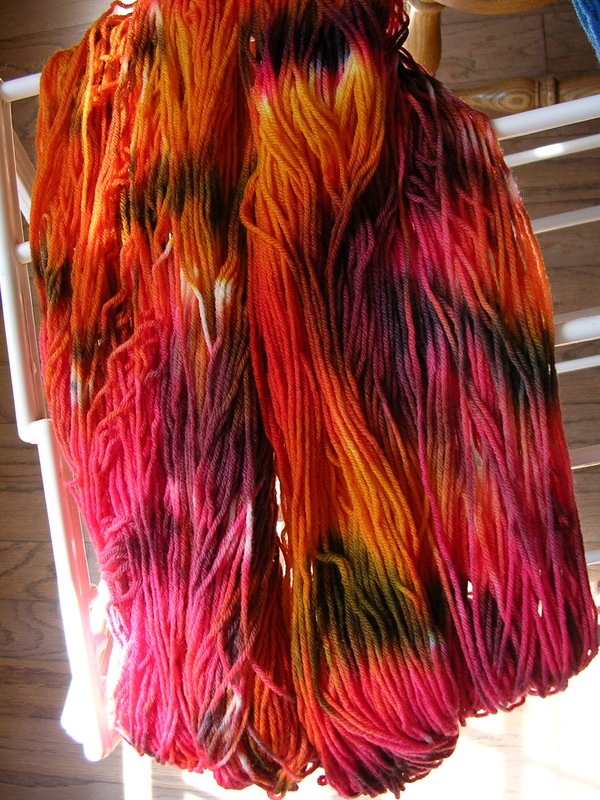 Lately all my yarns have been spun and dyed with certain projects in mind. This lends itself well to the careful and responsible use of all and sundry fluff. But I really just want to slap those babies into the kettle and have fun with them. I was standing at the checkout, minding my own business, when they sucker-punched me. Well, I guess I just shouldn’t have looked down. My mistake. An entire shelf of fluffy gray batts. Natural grays in lights and darks. Lustrous grays. Lincoln grays. Yes, one came home with me. The fiber’s a little . . . not necessarily coarser, but more durable than most of the ones I’ve worked with before. It’s my first Lincoln wool; I’m not quite sure what to do with it other than pet it. (And hope the little furry thing doesn’t turn out to be a Tribble.) It’s too coarse for spinning laceweight, but there’s only an ounce there, so whatever I make it’ll have to be for a small project. Maybe trim or a contrasting color for something. I never thought I could get out of the habit of spinning incessantly, but somehow I managed it while we had company for two weeks. I am now trying to get back in as fast as possible. Here’s the second bobbin-full of merino. That thing is so soft! And then I pulled the Walking Wheel out from where it had been buried during the visit (it takes up our entire living room, so we had to move it temporarily) and was planning to start in on the alpaca again. Well, of course I have socks, but I’m referring to a very special pair. A gorgeous pair. Of the “thick-warm-squishy homespun” kind. I have worked with the alpaca and come out on top. I have conquered, and I’m loving it. It’s really weird how different it is from regular wool. I can’t think of how to describe it expect that it’s “buttery-er” than wool. It kind of slides along. I’ve been spinning it on the Walking Wheel. The original idea was to try for a sport weight yarn, but I don’t know if that’s what this will turn out as. I spun a gazillion little samples to see what the best amount of twist would be. (And promptly forgot which sample went with which amount of twist.) But, the alpaca seems to be behaving, and I’m getting pretty good at separating out the coarser, slippery hairs. Wait, that sounds funny—how can something be slippery and coarse? . . . but that’s really the only way I can describe it. I made a ton of progress on the Jester batt yesterday. In fact, it’s all spun into singles and almost half of it is plyed. I just love the brown and copper look of the finished product.